Since 2013 scoreandchange.com offers insightful stories, case studies and analyses about the international sports business sector. We share articles about (digital) sports marketing, management, finance, sponsorships and startups. 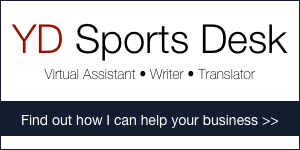 You can also find an overview of upcoming sports business conferences and sports events on the website. Scoreandchange.com offers companies the opportunity to advertise their events or products on our website. Would you like to know more about advertising with us? “We’ve been advertising on scoreandchange.com since 2016 and have been really happy with the platform. It helps reach our target audience and has converted website visitors to attendees at our events around the world. You can also drop us a line on Twitter or Facebook. We make every effort to ensure the information on scoreandchange.com is accurate. We assume no liability for any inaccurate, user or third-party content on our website. When you encounter inaccurate information we would greatly appreciate it if you could contact us. Thank you very much Greg for letting us know! Nikoloz Basilashvili with Hydrogen clothing, Nike shoes and Head for rackets should be added. Thank you Liam for informing us. We have added him to the list. I would like to attend the conference since am a marayjoner and looking forward to be a promoter in athlete. Thank you for letting us know, Marco. We have added her to the list. Do you have contact info for UNIQLO tennis sponsorship? Love all the content info on your site! Thanks so much! Thank you Tony! We don’t have that information, so unfortunately we cannot help you. What a great website. Keep up the good work! Hello Matija. I sent you an email. Hi Vickie. I just sent you an email. Thank you for visiting Score and Change. I’ll send you an email! Hi, I would like to get in touch with you. Even I am very enthusiastic regarding sports and business. I myself is a national level badminton player in India. Lets connect together to have some interesting discussions. Can you share your email id? Hi Malhar. Thanks for getting in touch. I’ll send you an email!